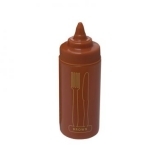 Clear, flexible, soft plastic bottle with screw top and wide neck for easy refilling. 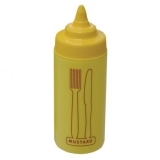 Use for dispensing sauce or decorating. 24oz / 680ml capacity. Please note - there are no measuring increments on the bottle - the total volume of the bottle is roughly 680ml.